Illinois Basin’s New Albany Shale: The Next Big U.S. Horizontal Oil Play? If you were on the hunt for the next big horizontal oil play in the U.S., where would you be inclined to look? Texas? That makes sense; Texas is the top oil producing state in the country. California? That also makes sense, California has been a top oil producing state for decades. But Illinois? Well, would you believe it has produced 4 billion barrels already, and 4 Tcf (that would be Trillion cubic feet) of natural gas? It’s true. And now, there are rumblings of something very significant happening again in the Illinois oil patch–rumblings of a big horizontal oil play. Companies in the region are keeping their cards close to their vest, but there is enough information in the public domain to know that some oil companies think the Illinois Basin’s New Albany Shale could hold a sizable shale prize. In fact, I’m very surprised we haven’t heard a lot more about this basin yet. 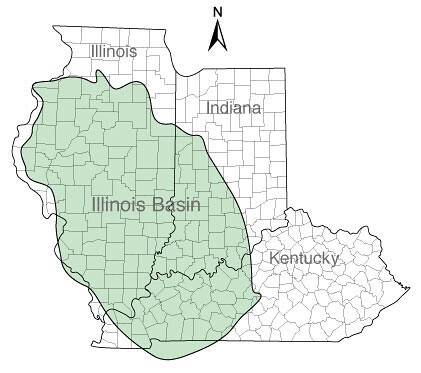 The Illinois Basin is an oval depression that’s roughly 60,000 miles in the United States Mid-Continent—southern Illinois, southwest Indiana and northwest Kentucky. In the 1930s a second boom started when seismic technology became available and helped to pinpoint oil pools. This made oil a lot easier to find, and this oil boom lasted through the 1940s and 1950s. Production peaked in 1940 at 147.6 million barrels. After World War II, production rates fell because all of the easy targets had been drilled. During the boom the Illinois basin was the third largest producing oil basin in the United States. Since then production has declined with no new oil targets to drill. That historical production of 4 billion barrels of oil and 4 trillion cubic feet of natural gas was all done with vertical wells in old-style, “conventional” oil pools; not today’s shale or “unconventional” plays. All that oil had to come from somewhere. Underneath all those conventional oil pools is the New Albany Shale—and oil and source rock analysis indicates that’s where the oil came from. Given the success of all these other shale plays in the US under very similar geology, those source rocks could provide a re-birth for oil production in a region that has been in decline for more than half a century. 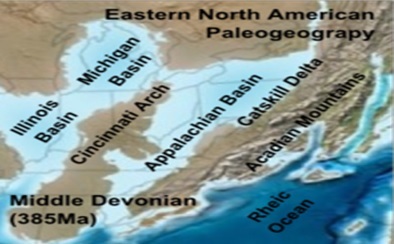 The New Albany Shale is Devonian age and was formed roughly 350 million years ago in a shallow sea that once covered the eastern half of the United States. So it was deposited at the same time as some of the most prolific source rocks in North America—that’s certainly a great pedigree! 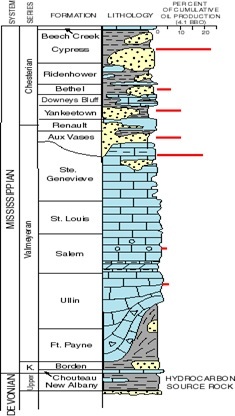 If the other source rocks have borne major horizontal resource plays why wouldn’t the New Albany Shale? A 2002 study estimated that the New Albany Shale was deep enough to have generated up to 300 billion barrels of oil—that’s what the industry calls OOIP—Original Oil In Place. With that much oil in place, the New Albany shale has the potential to be another big—very big—horizontal oil play–even if only a small percentage can be recovered. 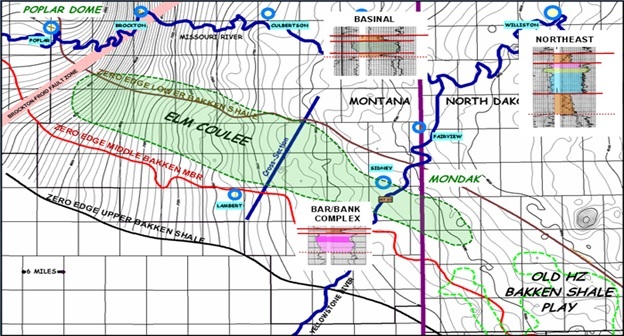 What these companies and their geologists have found has been encouraging as it has led them to conclude that the best analog for the New Albany Shale appears to be the Elm Coulee Bakken of Montana—which has produced 123 million barrels of oil from horizontal wells so far. The New Albany and Elm Coulee are similar in age, porosity and size. No two shale plays are exactly alike, but there is good reason to believe that a short learning curve with horizontal wells could move the New Albany Shale from being a potential shale oil play to the real deal. The New Albany Shale is developing the same as the Bakken, Eagle Ford and other horizontal plays. First you find a basin that has produced a lot of oil already. Step two: identify the source rock that still contains huge quantities of oil; usually a bit deeper. Step three then is to “crack the geological nut” and figure out how to get enough of that huge amount of oil left in those source rocks out at profitable rates—that requires fracking. Step one and step two are already complete for the New Albany Shale. How close we are to step three is hard to tell. The companies operating in the region have drilled a few wells, but the results have been kept very quiet to date. Companies don’t promote bad results, and good results are kept even quieter since letting that information would immediately drive acreage prices through the roof. What we know for sure is that the oil is in the ground in the New Albany Shale. Decades of conventional production tells us that. What we also know is that enormous tracts of land have been leased over the past couple of years in the basin and we know that prices per acre have already at least quintupled over that time. Someone wants to lock down that land. Horizontal drilling combined with multi-stage fracturing may again be the miracle that releases the oil trapped in the New Albany Shale. The potential of this play is exciting, and still quite early stage. And I just found the one junior explorer that has some incredible leverage to this new play. Stand by for the details in my next article.